Who doesn’t love to play with their food? Experiment with edible flowers from our garden to your plate. These colorful, and flavorful, flowers can garnish a entrée, baked good, or can be tossed in a salad or cool beverage for an extra sweet and tangy taste. TIP: Although it can be fun to use a whole flower on something like a cupcake, we also like to break up the indivudual flowers into peltals and and just sprinkle over your entree just before serving. Sold at the peak of freshness. 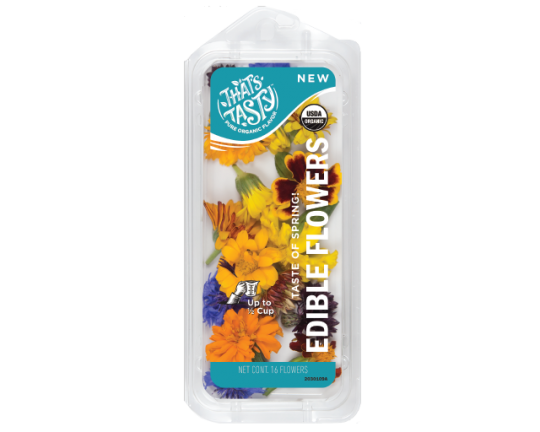 Our edible flowers are grown and sold to be used right away for the best flavor. Let the flavor confetti fly! “Edible Flowers are happiest inside its package, hanging out in your refrigerator drawer. Put edible flowers in an ice cube tray and fill with water. Use the ice cubes for fresh cocktails or when you are trying to impress guests at a dinner party. Any baked goods can be topped with edible flowers. Edible Flowers can amp up avocado toast and make it looks so fancy.